Every year, drivers in South Florida pay about $400 dollars extra a year for car insurance. That's because so many people are either driving without insurance or handing police officers a fake insurance car. 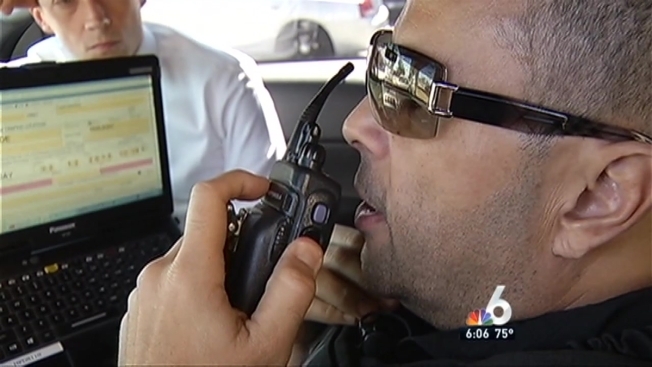 On Wednesday, officers in the Hialeah area cracked down on uninsured drivers. "It's bad news for dishonest drivers and good news for honest drivers," said Lt. Gary Zogby of the Hialeah Police Department. Dozens of police officers patrolled the streets. When they pulled people over for traffic violations, they checked to see if their vehicles were insured. It's information that's not typically available for officers to verify during a traffic stop. However, representatives from 27 different insurance agencies filled a room inside the Hialeah Police Department. When an officer pulled over a driver, they called the insurance command center to have one of the insurance companies verify their proof of insurance. A crew from NBC 6 went along with police officers and witnessed officers pulling over drivers for various insurance violations. One man handed an officer a fake insurance card for a company that didn't exist. He told police he bought the card in the parking lot of a restaurant. Police arrested him. Another woman was caught driving with a suspended license and no insurance. In all, dozens of drivers were cited for various violations and police made two arrests. "Too many drivers are used to downloading a fake insurance card from the internet, putting it in their wallet and they get away with it," said Lt Zogby. Officers warn they are setting up similar operations in cities across the area. Presenting an officer with a fake insurance card is a felony and can land someone behind bars for up to five years.